A week ago Ming Zhen Shakya (to many of us simply Em, as she liked to sign her emails) passed away. She touched the hearts of many people to who she taught the Dharma, giving sensible counsel to anybody in need. We would like to share here the contributions of our sangha’s members all over the world, who tried to collect memories of years of teaching. Anyone who would like to contribute with our homage can write to shiyaosheng@gmail.com. Viendo los diferentes recuerdos de los estudiantes de Ming Zhen Shakya (para nosotros, simplemente “Em”, como solía firmar sus correos) uno toma perspectiva de su labor. Conocí a Em allá por el año 2004 cuando recién comenzaba la universidad. El azar tuvo su parte en esto. Habíamos discutido mucho tiempo antes con mi hermana si el Zen era una religión o un estilo de decoración y había encontrado la versión española del “Séptimo Mundo” escrito por Ming Zhen. El libro me fascinó y creció en mí la idea de que en el Zen iba a encontrar un camino a muchos interrogantes sin resolver que iban cobrando forma. Aún así no me contacté con ella (mi inglés era aún muy malo en ese entonces) y preferí seguir leyendo sus ensayos. Algún tiempo después, habiendo ya intentado poner en práctica muchas de las cosas que había leído decidí escribirle, desde ya pidiéndole disculpas por mi pésima gramática. Ante mi sorpresa, no sólo me respondió sino que me aseguró que mi inglés no era malo en absoluto. Esa era su forma de confortar a quién acudía a ella. Era el sueño de todo estudiante: rápidamente captaba el estado mental de su interlocutor y buscaba una forma de enseñarle. Si uno era más bien del tipo intelectual le recomendaba lecturas de gran interés… pero si uno se aferraba demasiado a ellas, pronto le diría que “el Zen se había transmitido de corazón a corazón más allá de las palabras” y que uno debería buscar comprender por uno y no por lo que escribió otro. Ella era en ese sentido enigmática y estaba pronta a cambiar de un método de enseñanza a otro cuando el anterior dejaba de funcionar. Poseía una increíble capacidad de análisis que le permitía poner en relieve las experiencias espirituales de místicos provenientes de diferentes religiones con un nivel académico, pero aún así, no se enorgullecía de ello, sino que con profunda humildad decía: “sólo soy una sacerdote budista”. Hace un par de años, comenzó a escribir cuentos (algunos de los cuales se pueden leer en la página de ZATMA en inglés) en los cuales se intercalaban hermosamente detalles de nuestro camino budista en la trama de personajes para nada corrientes. Leerlos es realmente un placer. Nunca dejaba de buscar nuevas formas de enseñar el Dharma. Su capacidad de trabajo era incansable, incluso a su avanzada edad. Si uno le enviaba un correo a menudo en menos de una hora allí estaba Em respondiendo. En muchos casos, se tomaba un gran trabajo, buscando referencias, enlaces en internet o imágenes para aclarar o explicar algo. Aún cuando ya su luz se iba apagando y ya no podía responder a los correos, cuando nos comunicábamos telefónicamente me hablaba de los proyectos para el sitio web y me exhortaba a seguir trabajando en la serie de “pequeñas historias” que venía publicando hace un tiempo ya. El Dharma lo era todo para ella. Le estoy enormemente agradecido por su enseñanza, pero por sobre todo, por su forma de enseñar, su gran calidad humana y su enorme sentido del humor. Cuando conversábamos, su risa era tan contagiosa que era imposible contenerse y, definitivamente, sabía como contar un chiste. No quiero extenderme más sobre sus cualidades, Em era una mujer con un gran pudor para los halagos y no me lo permitiría. Perfectamente, podría ser su epitafio. Una persona no muere cuando su cuerpo abandona este mundo, muere cuando es olvidada. Y así es como Em, vivirá por mucho tiempo más en nuestra memoria y en su trabajo, en la gente cuyas vidas tocó enseñando el Dharma y en su hermosa familia, de la que estaba muy orgullosa. Each morning I walk out into my small cozy sitting room in the back of my house. I sit down with a blanket across my knees and open a small laptop and think of Em. It was from this place, on a laptop for over 12 years that I had contact with Em. Often in the early morning, in the dark, in the cold and heat, in the winter and spring I would send a question and she would respond. There were times when I was full and ecstatic, elated with joy and God. And she would send back just a word or two telling me to enjoy the kensho while it lasted. At other times I would be on the rack of delusion or greed and she would send me a tome of words trying to help me get myself off the rack. Sometimes the e-mails would be terse, sharp and quite exacting, at other times they would be verbose, dense and I’d need to search references and ideas on Google. But all of them were attempts to direct my mind towards something bigger, something more universal…something Em and I both called God. We never defined God…because we both knew the inexpressible, indescribable cannot be boxed or packaged nor was God captive to any set religious tradition. I met Em after reading one of her articles. I remember reading it and saying to myself, “This woman knows something I don’t know.” It is how our relationship began. And it was the bridge I crossed to contact her. As in all relationships we weathered many things. We did not always see eye-to-eye. On her death bed she told me that our differences, many of which I vocalized, pleased her since she did not want a “Yes Man.” I laughed. For me, her willingness to stay the course showed me more than anything her devotion to the practice of liberation and her generosity to smash and cut through the heaps of Zen baloney I had taken to be true. More than once she told me I was lucky to have found her and this Southern School of Hsu Yun. On this we agree. I was and am lucky. Many begin this practice, but very few finish. She gave many, many strong, robust konks to my head and cut away many subtle material desires from my path. As the Dharma became clearer, my gratitude grew bigger. And I suspect both will continue. I do not feel the loss of Em. I feel an eternal Presence that includes her. She was and is my teacher. She continues to teach me like a resounding echo along the great procession. Who would not be grateful? I am forever grateful. I will close with two poems someone sent to me. I first met Ming Zhen Shakya through her book, The Seventh World of Chan Buddhism. After reading it, I had a lot of questions and decided to contact her for help. Her first teaching was an awakening. She first showed me how stupid and sectarian I was and then accepted to train me. She showed me my ideas were too small, too constricted. I thought one school of religion was better or worse than another school. While being grounded in the Chan tradition, this venerable teacher showed me again and again how a true spiritual seeker finds light and love beyond words, no matter what his religion or cultural background might be. I did not have to be so small-minded. This approach was certainly one of her strongest teachings. Trust the Dharma. She applied Linji’s word “give the mind what it needs.” I needed to know about faith. I needed to see my ignorance and clannish view. And she knew that I did. She always followed and advised her students with just what they needed at the right time. Another of her strongest teachings to me was to root my practice in my daily life, not in some exotic, perhaps conjured up life. She taught me to see how changing diapers was where I needed to practice. 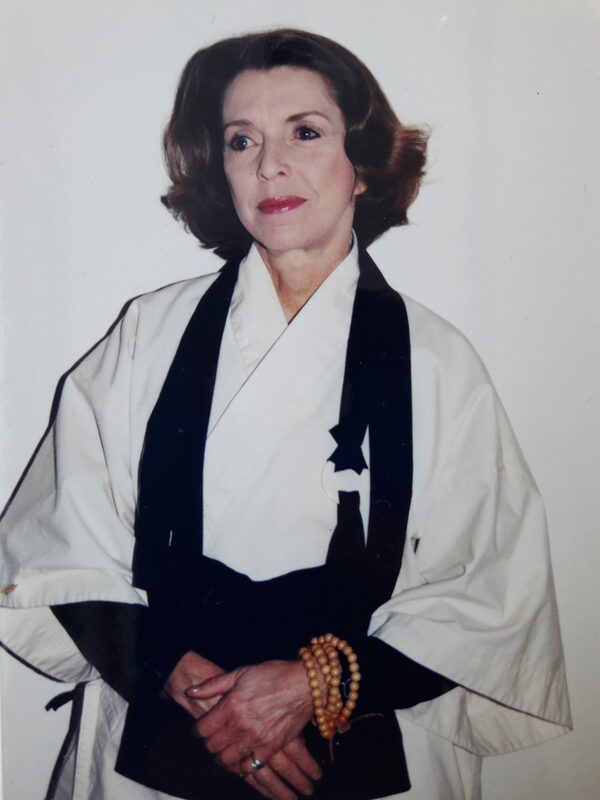 I remember how she insisted on what I would call recognizing the taste of Zen which meant not to limit myself to the authority of any school, master or tradition. She continuously pointed to the universal nature of life and pushed me to manifest it in my very own way. It is how she lived. Her life, her books and articles show the universal nature of life and is the wonderful treasure she has left behind. Just like Grand Master Jy Din Shakya, who had the courage and strength to adapt his centuries old Chinese Chan tradition to his Western disciples when he founded our Zen Buddhist Order of Hsu Yun ; our dear Ming Zhen Shakya had that same immense courage and patience to pass on the Dharma to her students in a consistent, harmonious and direct way. I was struck by the amazing and simple way in which she shared the very diverse Dharma that her life was. She never departed from her beloved Masters’s teachings (WeiYin Shakya and Fo Yuan Shakya) and insisted in transmitting the Heart of their Zen. Yet, one had to study a lot to be this venerable woman’s student. She gave many reading suggestions from her immense knowledge and practice of Alchemy, Taoism, Vedanta, Kashmiri Shivaism, Mahayana Buddhism, Pure Land and, of course, Chan and Zen Buddhism. She was skilled in language and had an uncanny ability to “translate” from one spiritual or religious tradition to another. Her humility was evidenced by her ability to remain a strong presence in the Dharma and rarely spoke about her own life outside of spiritual matters. Her insight of the Dharma was often shared using down to earth examples from the common and ordinary things of life. The short message she chose for her last teaching is a good example. She does not want to be remembered or admired, but points to what is admirable to remember. What does she leave us? She leaves us an imprint of the Dharma. A trace of actions and teachings manifested through years of teaching. The Zen Buddhist Order of Hsu Yun is the manifestation of her work with Grand Master Jy Din Shakya. And her teachings are a very personal manifestation of Hanshan, Hsu Yun, Wei Yin and Fo Yuan Shakya as she rooted them in her very body and mind. I am a bit apologetic or even hagiographic here… that is probably true…but to put it simply, this Old Sun of a woman was my Dharma Teacher. She was a wonderful teacher. I find it difficult to find the words because there are no words to describe the relationship with her. I am speechless and silent and in union with this beautiful silence. I vow to share this simple and profound practice for the rest of my life as a Dharma teacher. I sincerely hope that we all carry her Dharma heritage, and the heritage of Grand Master Jy Din Shakya, through our Zen Order and the vast amount of teachings she left us. 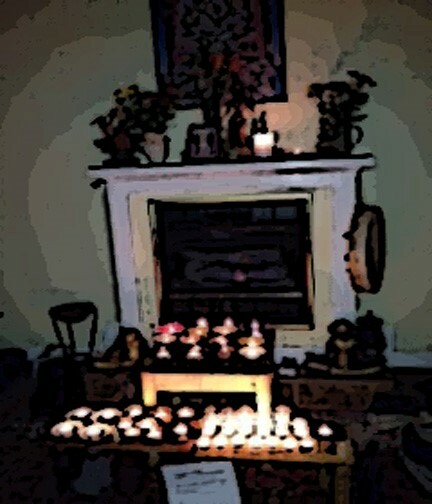 May our Zen Order and her teachings shine love and light beyond space and time. To me, Em was like a grandma. Actually I can say that in some ways she was more than a grandma. She was always there when you needed her and she always had the amazing ability to make you see things in different perspectives, especially when facing challenges and problems. Sometimes there wasn’t the need to explain a situation to her because she would figure it out before you could even finish. I had the good fortune to be in constant contact with her for many years beginning in 2003 when I began to practice. She was a person that you would always want on your side, no matter if it was for spiritual reasons or material worries. She had the amazing capability to be able to speak about any subject. I never got bored with her company. I wish that I had been able to be next to her on her final journey. 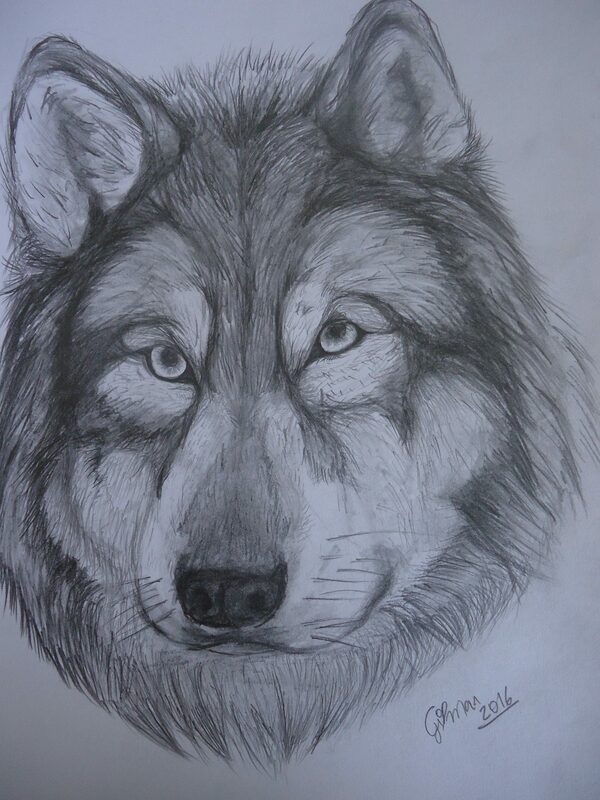 One thing is for sure, she was an important part of my life and she will always be part of me. She will be missed very, very much. There have been few situations in life that have caused me to be at a complete loss for words. 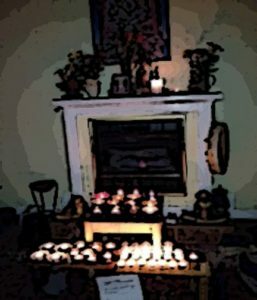 Anyone who has, with dedication, practiced Zazen for a sufficient length of time will understand some of those moments. Moments outside of moments. Some of our most ecstatic and blissful experiences allow us to step out of the raging rivers of time and view, however briefly, the majesty of this existence. Because of those moments, this life reveals itself as full of meaning and wonder and a purpose all its own. Because this path, by its very definition, is a long and solitary sojourn there are very few who are able to aid and succor us. At some point in our lives we find ourselves crawling along the floor of our darkest cave, scraping the walls and falling this way and stumbling that. Either by some miracle or act of desperation we experience a light. For some the light was so brilliant and majestic that it became another form of blindness. Stumbling from our caves we found ourselves flailing amongst the trees in the forest of all our vanities. 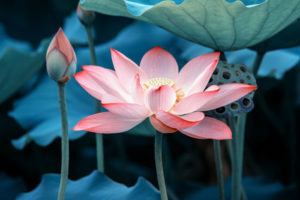 The rarest of all gems, the brightest jewel in the lotus is the person who can guide us through all levels of our ignorance. When, in the caves of our own ignorance, one who can be the finger pointing at the moon. When in the forest of vanities, one who supplies us with the pruning shears to clear away the dead and dying branches until we can finally see the root of all our travails. Emma was one such being, a buddha, and I will miss her terribly. Death can be a kindness, as the Buddha himself implied when he asked his disciples to thank the poor pig farmer for the tainted meat served at his last meal. Death brought the final kindness to Em as well. A gift celebrating a life well lived. The chains that bind all conditioned things have been broken. What remains is the realm of the unconditioned and what mystery is entailed beyond that gate is a mystery that remains for us all. Gone, gone, really gone, beyond forever. There is a great kindness in that. She had it. She shared it. She is empty. She has entered the ardent embrace of our Beloved. I write this in a sense to say goodbye though as others have noted Em will stay part of them forever. When I arrived in Las Vegas in the early 90’s I left a group in Albuquerque and searched for a replacement. Em put ZBOHY in the phone book. Intrigued I visited Em and never really left. Em and the practice have stayed with me even though our specific paths diverged. My experience with monks to that time had been in temples in Southeast Asia. Em certainly shook me out of that tree. Em represents the best of the monks portrayed in the Blue Cliff Record. One never got an answer you expected and when you think you ‘have it’ Em would laugh and slap her knee and send you scurrying for a better understanding. Thank you for all you have given us. Sorry Em we will gather around your dust for a while yet. Ming Zheng (aka Emma aka Em aka Lupi). If it weren’t for you, Hal and I wouldn’t be married. If it weren’t for you, I wouldn’t be a Buddhist. Thank you for marrying us in your living room wearing a housecoat with a random stranger off the street as our witness. Thank you for marrying us properly one month later at Mt. Charleston with our friends and family present. Because of you, my life is guided by the eight-fold-path…I stray off the path sometimes, but I always come back. Because of you, Hal and I have many inside jokes such as “Hashibah”, “Lay on, McDuff”, and “We’re golden.” I love you and will miss you forever, my wolf. Ming Zhen Shakya was my spiritual teacher, starting in the late 1980s. It’s hard to say exactly what Emma meant to me. I have known her since I read the Las Vegas Sun’s feature article about her after she first returned from ordination in China. Soon, I was started studying with her while she changed my life. I had studied Eastern religions and for many years, but she made it personal, alive, and vital. 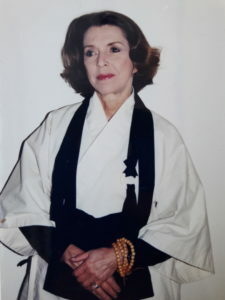 I took precepts soon after and became very active in the Nan Hua Zen Buddhist Society of Nevada, the organization she had started in Las Vegas. Soon I was ‘president’ and over the years we went through various iterations of sitting, teaching, meeting, and generally trying to find out who and what this group of seekers was all about. 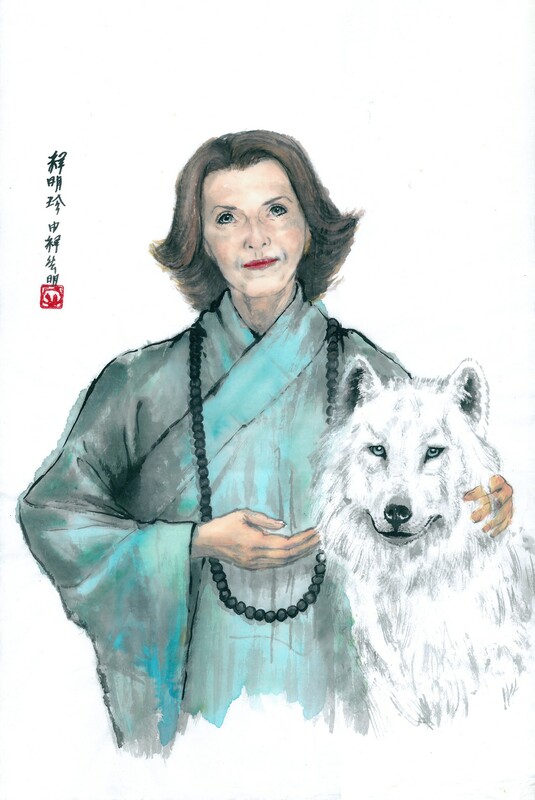 She often referred to me as ’The Chief Cat Herder.’ In the early 1990s she declared her intent to form the Zen Buddhist order of Hsu Yun, or ZBOHY, an internet zen buddhist ministry. I kept in touch with Emma and her husband James several times a year and took my son, Ian, to meet her in 2003. She proclaimed that. “Hal has great swimmers!” Later, my wife was ordained in the Order. Subsequently I received my Master of Art’s in Anthropology and Audrey got her Ph.D. in Geosciences. Our personal paths became more private and less public after Mm son was identified as Asperger’s/High-Functioning Autistic when he was 4, though we still kept in touch with Emma, Da Shi Chuan Sheng, and Da Shi Chuan Yuan in Brazil. In 2012 we left Las Vegas and moved to west Denver, to be closer to where in-laws as they were growing older. We found much more support from the local Colorado school district for our son’s needs. When I heard that her husband James had died last year, I felt it wouldn’t be long before the Merciless Ming would be passing as they were quite inseparable. My last communication with Em was about five months ago as she was preparing to move to Phoenix to be with her daughter and grandchildren. A couple of days ago I learned that Em had passed, around Thanksgiving. She clarified my life and set me on the path. I became ordained at her request and was elevated to Master with her recommendation a couple of years ago. I suppose I should enter the mourning crowd and cry, “KA!”, but I miss her so, and feel her passing very strongly. She was wonderful. yes? I wish to offer my sympathies and condolences to the family of Emma and her friends and colleagues on her passing. I came to the site to see if there was a new essay written by her and the news of her departure is truly a bolt of lightning. I first emailed her back in the 90’s and over the years I had the gift of her correspondence and the honour of meeting her in person when she drove to Palm Springs one Summer’s day all the way from Vegas. I had many lengthy teachings from her and many lengthy pauses in my replies the latest of which has lasted a few years until now. Each time I reconnected, she would be there chiding me for my tardiness and pushing me along the road. She opened my mind to vistas and understandings I could never have imagined would come naturally. She was a teacher, a confidant, and a friend. She illuminated my own life long before I saw those places without shadow. She taught with clarity and never hesitated to tap the path in front of me and hustle me on. She spoke of dreams and visions of poetry and song. She would take your hand and knock it against your own head when thinking was all I was capable of. She was a light and I am eternally grateful that I stood in it and experienced it and I am deeply regretful that I had not one last word with her but that too will be her final teaching to me for she has been teaching me every day since I first contacted her. To Em from the Irish one. Slan leat agus go raibh mile maith agat. I will read the coins again tonight and know you are now there part of it. I will look out and see you about. I will look in and know where you said to look. Foi através dos textos da Reverenda Ming Zhen Shakya que avancei pelo caminho do Budismo Chan. Sou profundamente grato pela oportunidade do contato com esta grande mestra, professora de um de meus mentores, Reverendo Yao Xin Shakya, e estou certo de que Ming Zhen é importante referência para muitos outros mestres e mestras da Ordem Hsu Yun. There are some people one encounters that you have an immediate sense of deep connection with. These days it can even happen on-line. I would venture to say the Heart to Heart connection does not need a physical presence. Emma was such a person. I felt an immediate connection with her on our first contact. 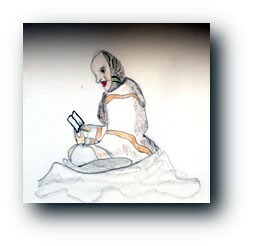 I had written a general note to the on-line Sangha here, seeking training. Emma responded, and we chatted over several letters. She gave me instructions on some meditation techniques to help my practice. She also touched upon by chance a couple of other points on related topics that helped explain a connection question I was working on. She was very open with help, guidance and her opinion. As it turned out we had a common friend, Da Shi Chuan Sheng. This gave us an additional connection as we both shared a long history with him. When I was ordained and told Emma, I could feel her joy in her expressed words of congratulations. Right off she explained a view pointers to me and offered help. I was quite touched, and surprised with her fast and in-depth replies. I knew she was recovering still from her hospital stay. When I received no reply from my last letter, I feared the worse. I am saddened at the lost of her presence, yet feel blessed I was able to had made a brief connection with her. She was a special person and will remembered and missed. I am indeed saddened to hear of the passing of our most beloved Em. Her patience, energy, life stories, strength, dignity, humour, and all her wondrous being.